The growth of Salesforce has majorly changed the way people maintain their accounting records, amongst numerous other business processes. This is why Trailhead is so important! 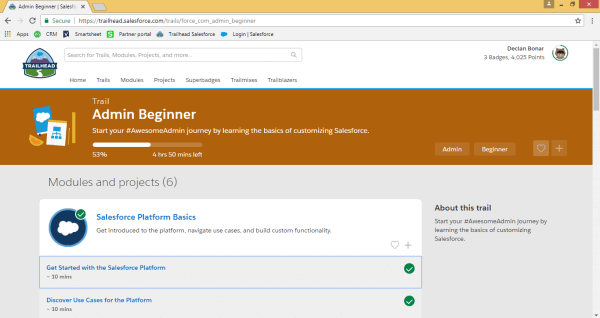 Trailhead teaches people, just like me and you, to learn how to use the massive amount of tools available on Salesforce. Salesforce is not just a CRM but provides a multitude of different features, useful for all walks of life. 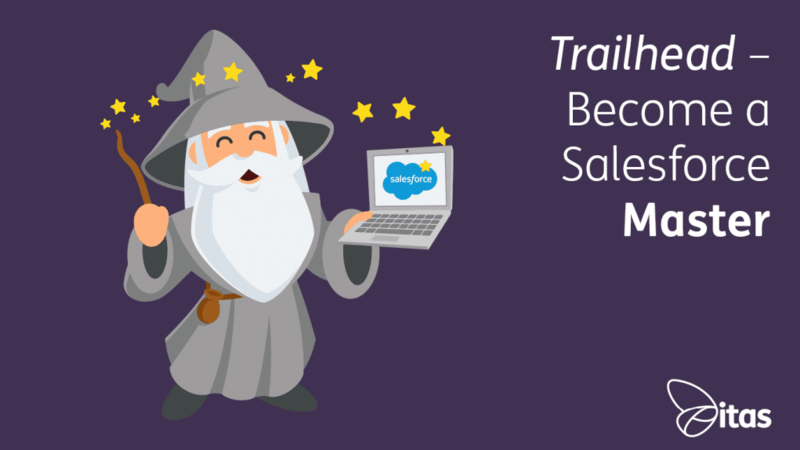 We will briefly talk about how to get started on Salesforce with the help of Trailhead, the basic jargon you should know, and use my experience with Trailhead to give a brief insight into this immensely helpful Salesforce trainer. Search for “Trailhead Salesforce” in your computer browser, and click the link https://trailhead.salesforce.com/. In the top right corner of the home page, click “Sign Up”. You are now given 3 options, “Sign Up with Salesforce”, “Google” and “LinkedIn”. Personally, I set it up with my LinkedIn profile, so it would be easily accessible from my home. Enter your personal details, and that’s it! You are now signed in with Trailhead. Congratulations! Wasn’t that hard, was it! That’s the type of experience you can expect throughout the rest of your journey on Trailhead. It doesn’t just throw you in the deep end from the start. It teaches you how to crawl, walk, then run. Due to its complex nature at its later stages, this method of teaching makes it a much smoother and relaxing experience. Additionally, it gives you a sense of accomplishment for completing its multitude of tasks, with points awarded for completing sections of modules, and badges for reaching certain milestones. It really does make it feel like you are achieving something significant. It’ll never leave you bored either! With its current 365 modules, there are hours upon hours of activities to undertake, for the basic to advanced level users. Org – Short for “organization,” it is the place where all your data, configuration, and customisation lives. You may also hear this called “your instance of Salesforce”, but don’t be alarmed, they mean the same thing. Records and Fields – A Record is an item you are tracking in your database. If your data is like a spreadsheet, then a record is a row on the spreadsheet. A Field is a place where you store a value, like a name, address or amount. A field would be a column on the spreadsheet. Objects and Apps – Objects are a collection of data. For example, the Account/Product/Invoice are just a few examples of objects. If you have certain objects that all work together in a business process these objects can be grouped together in the form of an app. Put simply, Apps are a collection of objects. Trailhead Playground – A Trailhead Playground org is a safe environment where you can practice the skills you’re learning before you take them out to the real world. Trailhead Playgrounds come with all the standard app building and customization tools required to test your app development abilities. If you’ve ever heard of a Developer Edition org, a Trailhead Playground is a special type of Developer Edition org. Therefore, don’t worry if you don’t see them on alternative Salesforce training websites. 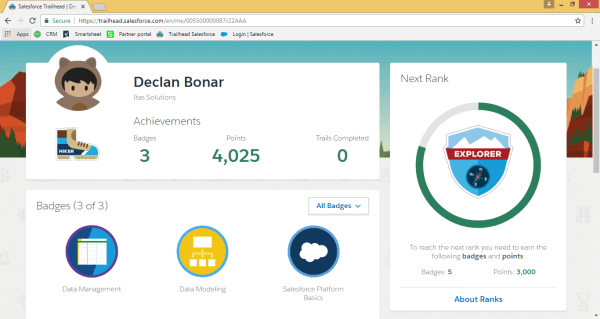 I have only been operating with Trailhead for a few days, but I must say its user-friendly interface has made it a fun and enjoyable experience. With its regular quizzes and tasks for you to undertake, there feels like a sense of accomplishment in completing every section of each module. 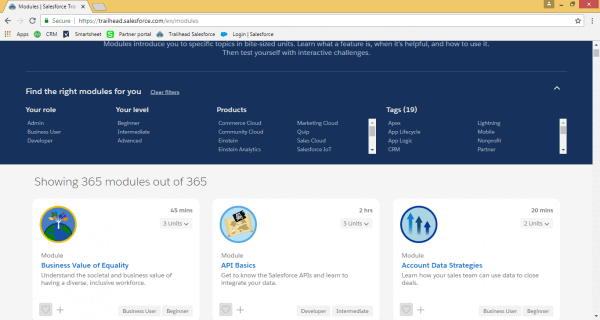 I am encouraged to delve deeper into Trailhead’s broad database of modules and trails. I feel proud of the badges I have achieved, and want to work that much harder to achieve the next one! If you have any queries regarding Trailhead, or more generally Salesforce, then please don’t hesitate to contact us. We’re happy to help, and I can assure you that there are more experienced users of Trailhead than myself in the itas team, so they will more than likely know how to fix any and all problems you come across.